From the first minute of life, the baby receives a dose of antibiotic ointment to keep her eyes from infection that may have entered the passage during extra-uterine birth. In the weeks that follow, an infection can occur despite everything, we noticed some redness and swelling at the base of the lashes, yellowish secretions, eyelids glued together and difficult to open their eyes and look at the light. One eye red and swollen in the baby is a sign of infection at 90% of the time. This infection can be bacterial (very swollen eyelids, redness and pus important), viral (eye that weeps a lot, moderate redness) or allergic (itchy eyes, watery and warm with low to moderate redness). The infection can also result from a flu, a cold or sore throat. From birth, visual communication is a key contact between parents and child. Any opportunity to maximize the exchange of glances to be preferred. Throughout his life, the child learns through his eyes, in fact over 80% of learning will be through the acquisition of information via the visual system. Since its birth, visual communication is a crucial contact between parents and child. Any opportunity to maximize the exchange of glances to be preferred. Throughout his life, the child learns through his eyes, in fact over 80% of learning will be through the acquisition of information via the visual system. The child’s vision develops very rapidly after birth. Each eye sees a short distance at birth and the age of six months the vision is comparable to that of an adult. Around the age of two months the color began to be collected and chromatic contrast sensitivity continues to improve during growth. The onset of binocular vision, or the use of both eyes in sync, is between the tenth and sixteenth week. The baby begins to develop stereoscopic vision, or vision into three dimensions, at the age of five months, a process that ends only at the age of six to nine years. The child begins to track objects moving slowly around the age of two to three months. Restricted visual field during the first months grew to reach values ​​similar to those of an adult at the age of one year. Several things could keep an eye to develop normally. The major problems of vision innate or acquired (9 to 33% of children), the presence of opacities such as congenital cataracts or eye disease (1%) or misaligned eyes (strabismus-4%) are factors that may lead to the development of an amblyopic or lazy eye in 3% of children or lack of vision in three dimensions in 5% thereof. When a vision problem or eye health is discovered, it must be immediately treated with either lenses (glasses), exercises (orthoptics) and / or surgery. It is important that everything be done before the age of 6 to 9 years since then, the neurological system is not soft enough to develop properly and defects of vision in one eye, or amblyopia anomalies of binocular vision such as vision into three dimensions, remain standing. To make things easier during the visual examination of the child, it is good to make an appointment at a time when the child is alert and awake. To answer questions from your family optometrist, you will need to document the family history of eye problems and diseases of the mother during pregnancy and the difficulties that may have occurred during delivery. Children under three years do not have enough experience to answer questions cognitive typical optometric examination. The optometrist then uses various tests requiring or not the use of drops, to objectively evaluate the child unless he or she need respond. More children getting older it is put to six years and its review is very similar to that of an adult. 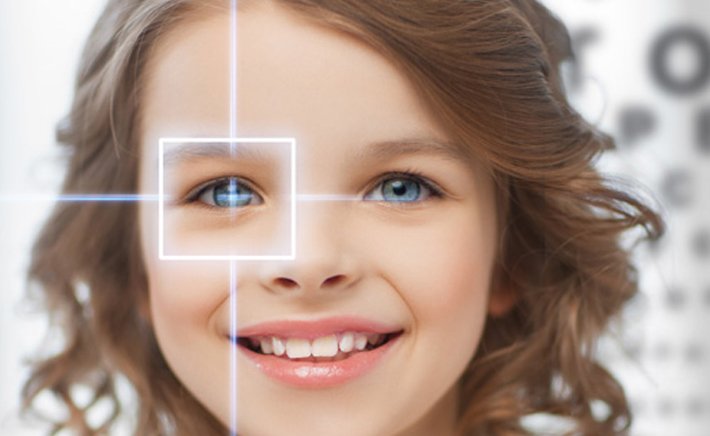 It speaks very little vision problems in young children because they are not very apparent in the population. Yet, these disorders can have adverse medical, social and economic significant for the future of children. They are severe such as glaucoma and cataracts, or sometimes lighter as myopia and strabismus, visual deficits must be closely monitored because they risk jeopardizing the child’s motor development. Sometimes they can also reveal an eye disease, orbital or cerebral, more serious. Following this work, they stress the need to detect the earliest visual pathologies. Some may indeed be corrected partially or completely, if done in the early years of life. And even when there is no therapy available, abnormalities of the eye must be detected early in time to guide the child to special educational structures that will allow better development and academic learning. The implementation of systematic screening of visual defects on ultrasound at the 20th week, at birth, the 4th month, between 9 and 12 months and in 1st year of kindergarten, through an arrangement of medical examinations already existing. Today the discovery of visual deficits is often fortuitous, because they are not always thoroughly searched. Information and public awareness of the importance of early detection of visual deficits for the further development of the child, through the press or by broadcasting. For experts, the campaigns of prevention of domestic accidents should also put more emphasis on the fact that they can cause severe visual deficits. The training of health professionals in pediatric ophthalmology General practitioners and pediatricians, most often in contact with the children that ophthalmologists should be able to identify certain abnormalities of the eye. Experts also recommend that the opticians are better trained in techniques of optical equipment for children. Improving access to care through better financial management of optical equipment (glasses, contact lenses, …) by public authorities. Better enforcement of the law on disability related equipment in public places for the visually impaired (bands of vigilance, beeps, Braille signs). The development of new screening techniques used routinely by the pediatrician and general practitioner. Today, even if the tools used are quite simple, only an experienced professional can see some very subtle signs of visual impairment in a child who does not speak yet. While experts stress the importance of early detection of visual abnormalities is that there is an age in which life support is more effective because the visual system is more sensitive to changes quality of the image. This “sensitive period” runs from the age of 6 months to age 5 or 7 years with a maximum sensitivity between 6 and 18 months. Treatment administered before the age of 3 years in particular gives a much better result. The decrease in visual acuity resulting from myopia, astigmatism or farsightedness can be completely treated by optical correction involving the constant wearing of glasses or contact lenses if symptoms are significant. About crossed eyes, studies show that over the alignment of the eyes has been obtained earlier, more cooperation between the two eyes is satisfactorily completed and the better the vision. As for serious diseases, early treatment is really important: it saves the prognosis of the child in cases of retinoblastoma, or to limit the risk of blindness caused, for example, glaucoma or cataracts. Early detection can also look at the earliest if the disorders are observed any sign of more serious conditions (an injury or brain tumor, retinoblastoma, cataract, albinism …). Learning vision, learning to read … These two fundamental achievements will follow naturally in the child’s life. The vision of the young child builds, perfect from birth to 4 years, age is confirmed his interest in writing. Many years will then flow to that about 10 years, he calls “a real book.” Yet experts note a correlation between the quality of reading and that of vision. Introduction to writing (the child plays in tracing loops, bridges, poles, name), reading (he learns to read his name, to recognize certain letters …) is a large section kindergarten or first grade entry (CP) prove that some undetected visual defects in infancy. • It is overly sensitive to bright light. If the child has any of these characteristics, it is (perhaps) a minor defect, a gene that is not necessarily linked to a visual defect. Parents should take the advice of a specialist for safety. In the absence of treatment, its evolution is fatal, but current treatments can get a good cure rate. Visual loss, however, still remain important. Glaucoma eye condition characterized by elevated intraocular pressure. Nystagmus: involuntary movements, jerking of the eyeball, which are congenital or symptomatic. Retinoblastoma: Retinoblastoma is a malignant intraocular tumor most common in children.